Our Holy Father Pope Francis has never made his ascetic way of life secret. 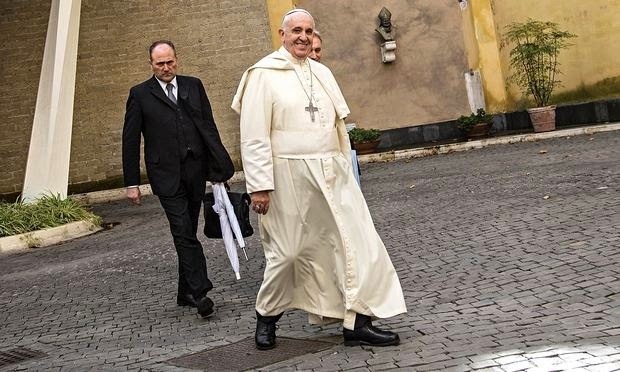 Since his election to the Papacy, he has opted out of living in the lavish Papal apartments and other amenities that comes with this new role. Recently, he gave the okay to install showers so the homeless can wash up. Well now, he is having a raffle that will take place January 8, 2015 at the cost of 10 euros per ticket. The raffle will have as prizes many items Pope Francis has received as gifts. 1. Fiat Panda 4x4 1.3 JTD. 2. Racing bicycle (light blue). 3. Bicycle (orange) with panniers. 6. Sony HD digital video camera. 7. Illy Iperespresso coffee maker. 8. JBL Wi-Fi dock for iPod and iPhone. 9. Ottaviani ballpoint pen with silver trim. 10. Leonardo Argenti silver picture frame. 11. Brosway gentleman’s wrist watch. 12. PTM document case in brown leather. 13. Homero Ortega white panama hat – plus around 30 “consolation” prizes. The money generated from this raffle will be used for the poor. What a great example our Holy Father is giving us. I pray and hope more clergy and lay people do similar works of love. God bless Pope Francis!